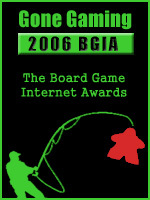 I, and the staff of Gone Gaming, are proud to announce the Gone Gaming: Board Game Internet Awards for 2006. 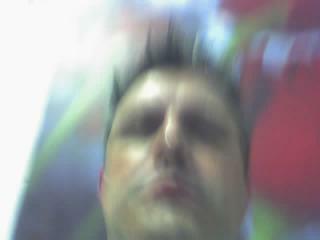 I will post separate entries on this blog, one for each of the above categories. To nominate a site or article, simply respond to the appropriate post with your nomination before the deadline (see the rules, below). Note that it is ok to nominate your own article or site. After receiving the nominations, the staff of Gone Gaming will review the nominated sites and vote on them. The votes will be collated and ranked, and the winners will be posted to this site. Winners and runners-up will be able to place an image proclaiming their win on their site. There may be up to five runners-up in each category. 1. Valid sites for this award should primarily cover modern board gaming, including Euro-style and wargaming. Sites that primarily cover old-style board games (such as Chess), CCGs, RPGs, poker, or miniatures are not eligible. In case of doubt, the Gone Gaming staff will decide on the validity of a site. 1a. Sites that require payment to access will not be considered. 1b. Sites that require registration to access may be considered. 2. Sites will be judged based on their English language content. Unfortunately, we are not able to judge non-English content at this time. 3. A site nomination will be deemed invalid if the Gone Gaming staff says so. Invalid nominations will be removed, in order to avoid clutter. 4. You can nominate a site in more than one category. However, please nominate a site in a category only if it is appropriate. 5. A site should only be nominated once in a category. Before nominating a site, please check to see whether or not it has already been nominated. Duplicate nominations will be removed, in order to avoid clutter. Remember: you are not voting for a site, you are only nominating a site. 6. The Gone Gaming blog may not be nominated. Sites by Gone Gaming members may be nominated. 8. If your site is nominated but you do not want it to be in the voting, please send me an email (shadejon-[at]-gmail-[dot]-com) with your site name, URL, and a statement that you do not wish to be nominated. 9. Nominations close at midnight (EST) at the end of Saturday, Dec 30. The awards will be announced by midnight (EST) at the end of Saturday, Jan 13. Update: due to some illnesses and travels, the announcement is delayed until Jan 23. We apologize for any inconvenience. Update: Best Humorous Article re-added due to popular demand. What? No award for best game-related poem? Aw, shucks! Best Humorous Article re-added due to popular demand. I still think a poetry category here would be good in the future. The BGG contest was over before I even knew it existed. This may be a little self-interested, because it's the sort of article I like (and write), but I'd like to see a category for 'analysis' articles. I think that's a clear category apart from 'strategy' or 'review'. Chris: Isn't an analysis one of either a review or a strategy article? Isn't an analysis one of either a review or a strategy article? I don't think it is; take for example Shannon's article on this blog relating to mathematics in games. In it he breaks down two games and focuses particularly on certain numerical aspects. So it isn't a review essentially and is definitely not about strategy - it must be analysis. Of course, Chris's analysis is frequently more direct (appertaining to a particular game) than Shannon's general analyses (comparing the same aspect of different games). Well, speaking for my own site, The Journal of Boardgame Design, every article is a piece of analysis, but none are reviews, strategy, or industry-related. Arguably my piece on Ticket to Ride is a review - but that wasn't really what it was intended as. It was really more a case example of what makes a good game work well. Fellon, Chris, Johnathan: Well, that's just because I'm an idiot and misnamed the "Industry" award. I intended it to be for articles about gaming or the game industry in general. So analysis articles would go in there, if they are really not about strategy or reviews. Please give me a better name for the award and I'll correct it. I could also split it, if it's necessary. BTW, I hope there are no demerits for nominating my own site. I looked at the rules, saw no prohibition, and thought: "what the heck, let's at least get in the race." Jon: nominating yourself is fine. Part of the reason for doing the awards is for people to show us things that we may never have seen. Re: General Gaming Article lacks something. For now, just dump both into the "Industry" award and we'll see how it goes and keep thinking. To me, that doesn't really cover game analysis. Maybe it should be something like "... any article covering broad topics of general interest to gamers, such as game industry coverage, boardgame advocacy, game or game system analysis ... "
Did the 2006 Board Game Internet Awards winners get announced? I can't seem to find them. Anon: Sorry for the delay. We're sill going through the numbers. What is the new deadline for announcing the winners?